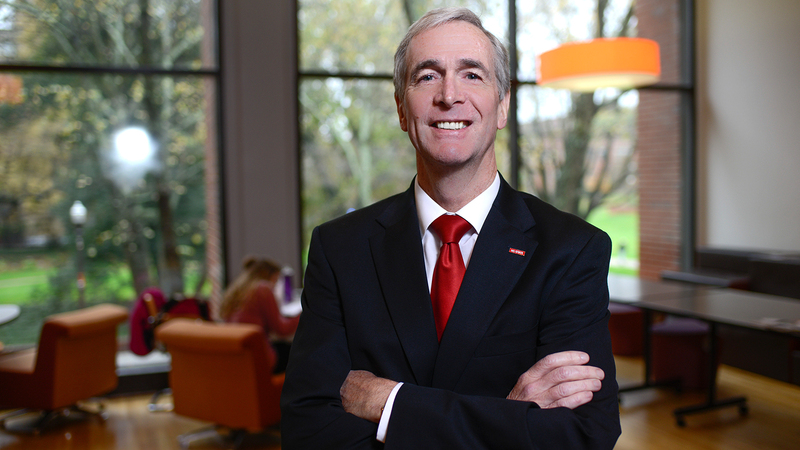 Meet Jeff Braden, dean of NC State’s College of Humanities and Social Sciences. He’s a psychology professor who’s called upon nationally and internationally for his expertise in how school systems can best assess students with special needs. He’s been a certified sign language interpreter, and he’s the only dean we know of who’s worked with – and been bitten by – a chimp. He is a bit of a technology geek – he loves exploring new tech devices. He relishes nothing more than sharing a good joke. And he’s the biggest booster around for NC State’s College of Humanities and Social Sciences. Dean Braden has been a professor of psychology at NC State since 2003. He directed the university’s School Psychology Program from 2004 to 2007, when he became the college’s associate dean for research and graduate studies. He was named dean in 2008. Before he came to NC State, Dean Braden taught and directed school psychology programs at the University of Wisconsin-Madison, San Jose State University and the University of Florida. He holds graduate degrees from the University of California, Berkeley, Gallaudet University and Beloit College. Braden has chaired the American Psychological Association’s Committee on Psychological Tests and Assessments, worked with the Research Institute for Secondary Education Reform for youth with disabilities, and conducted international research on how best to conduct educational assessments. Recently, he won an award from the Bill and Melinda Gates Foundation to conduct a randomized trial to compare an online, adaptive learning version of introductory psychology to traditional instruction. NC State upperclass students are invited to join three NC State college deans — Braden, Hoversten and Ranft — for Designing Your Life, a two-part workshop based on the bestselling book and design thinking, a process designers use to build and innovate. Promoting the welfare of the college through advocacy, fundraising and service — that's the important role the Dean’s Board members play every day. Through their involvement and engagement, they advocate for the humanities and social sciences at NC State, across the state and beyond.